Peyman Viyan, a member of the Free Women Association of Kurdistan, talked with the Euphrates news agency about the uprisings of the past two years and the pioneering role of Iranian women in protests. Referring to the recent two-year protests by Iranian women for the removal of the Hijab Law, Peyman emphasized that this is the primary right of women to decide what they wish to wear. After the regime came to power, as the first act they enforced Hijab on women. Women’s art and sports were banned. Whereas this is a natural right, not a political demand. However, to the regime, demanding a natural right equates to a political demand. When women demand their rights, they find themselves treated as those who stand against the regime. Right now Narges Mohammadi is being tortured in prison because she requested to end the forced veiling of women. We, as members of Free Women of Kurdistan, consider such demands as a natural right and opposing the misogynistic rules of the regime as part of our struggle. We are aware that the Iranian regime is fundamentally against women, and although it appears to be praising woman as lip-service, in reality, the system is based on anti-woman rules. 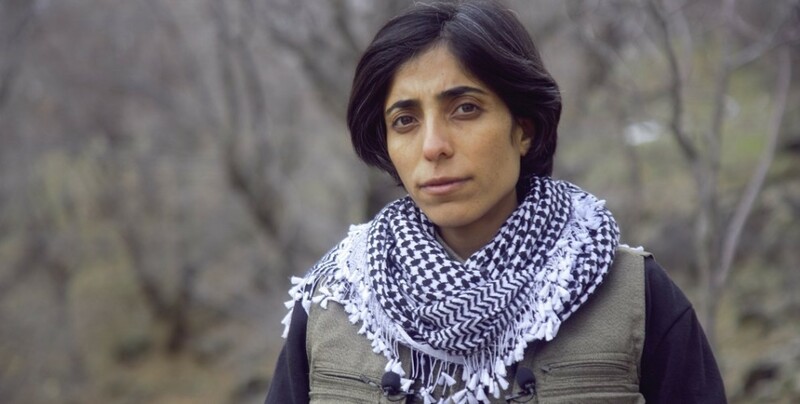 This member of Kajar (Free Women of Kurdistan) further noted that women in the Middle East and Iran need to defend themselves because they are targeted intellectually and physically. If they do not have the power of self-defense and self-organization in this age, they will not be able to stand against the dominant mentality in Iran. 1- Self-organization and Women’s Alliance. 2. Setting up a women’s advocacy force. Self-defense does not mean just to take up arms. If women can organize themselves and manage to advance their scientific level, that also is a form of self-defense. Today, women are physically killed or tortured, so it’s a duty for women to take up arms. We must assemble the military force of women. Just as ISIL attacked women and women defended themselves and fought against ISIS, now in Iran, we need women’s advocacy against the regime’s misogynistic mentality. At the end of her speech, Payman noted that our struggles are not only for Kurdish women but for all women of Iran. We, as the Free Women of Kurdistan, want to embrace all women as defending every Iranian woman is our duty. In Iran, women have been massacred, tortured, but never surrendered to the regime. Women have never lost their will. Women, despite all the dangers and imprisonment, demand freedom. This is why all of us, whether in the mountains, in the parliament or among the community, stand united and win the struggles of women.